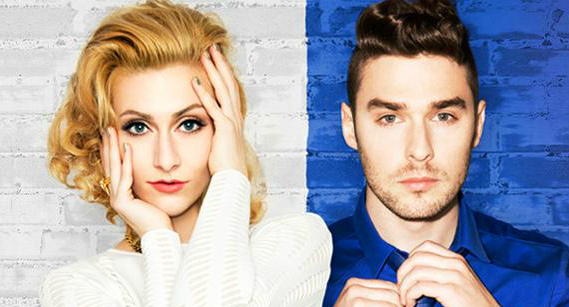 Engaged pop duo Karmin released their debut album Pulses yesterday, and it is a beautiful testament to pop done right. Following their successful EP Hello, this new set features Amy Heidemann’s trademark soaring vocals and lyricist skills, but Nick Noonan steps out of the shadows to be a lead vocalist and producer. All of this comes together to create an album and a sound that is 100% pop, 100% original, and 100% cool beans. Truthfully, to simply label Karmin’s music as pop is to shortchange them in spades. The Berkelee College of music grads have much more nuance in their work than other songs that go over well on radio. They have elements of hip-hop, reggae, R&B and dance mixed in to make a sort of super powered pop. All of this is epitomized in their single “I Want It All”. I’d be hard pressed to categorize this song in any way except to say that it is gold. It comes as no surprise that the harmonies across this album are stellar. And the album opener, “Geronimo Intro”, makes that statement with its acapella arrangement. This is also showcased on the aptly titled “Acapella”. For the finely tuned ear, the amount of effort put into every bar of this cheeky head-banger shows that pop music doesn’t have to be just for the common denominator. Party tracks “Nights Like This”, “Drifter”, and “Puppet” are grounded in easy-to-commit-to-memory hooks, but have the feel of artists left to work without any creative restraints. That unexpected magic that is Amy’s rapping brings that little bit of extra that sets them apart from the pack. It’s like they have the freedom to feature Nicki Minaj on any track they wish, except that the lyrical wordplay is intelligent. The perfect example of this is their most recent single “Pulses”. It walks right on that line between hip-hip and pop in a way that appeals to both audiences. The ballads on the album, “Neon Lights” and “Tidal Wave”, are surprisingly introspective among such a lighthearted collection of songs. Both tracks give listeners a chance to understand how Karmin’s rise to stardom from YouTube has affected the couple. “Neon Love” discusses the pitfalls of fame without coming off as weepy or self-indulgent. And on “Tidal Wave”, Nick shows off his Ryan Tedder-like vocals to cover the difficulties of fighting for love. Are there songs that aren’t as successful? Sure. This album could have easily been strengthened by cutting the tracklist to 10 tunes, but that’s not to say that there is any bad material to be found. The album is listenable in its entirety; no skips necessary here. Pulses is a party. From front to back, this is the pop album catered toward the music snob. So of course, I’m in love. Are you falling for Karmin like I am? Share your thoughts in the comments section below!